The Dark Legions Game Review - Download and Play Free Version! Find Vengeance on the Evil King Frank Kalap! In the year of 1267, the evil dark lord King Frank Kalap foresaw his defeat by enemy forces lead by a child. His assassins scoured the country side. They laid waste to entire villages in order to find this future threat and eliminate him. In the end they found their target and destroyed his entire family, but for his brother Theodric who fled into the woods. Now comes the time for Theodric to seek his vengeance upon the evil King Frank Kalap and bring peace to the land. Get ready to quench your thirst for medieval real-time strategy gaming with Dark Legions. Add in a dash of large maps and a unique campaign storyline, and participate in epic battles as you build up your empire. Explore the immersive story or play against computer players in the equally entertaining random maps. 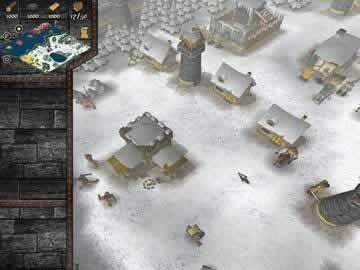 Dark Legions presents an enjoyable RTS experience that is akin to many other mainstream games. Let yourself get drawn in to the resource and base management aspects of the game, and stay for the heroic battles with 18 different unit types at your command. If you are any fan of real-time strategy games, then download Dark Legions and bring down the evil king! The year is 1267 and you are Theodoric, the only surviving member of a family slain by King Frank Kalap. Now that you are strong enough it is time to exact your revenge. In this real time strategy (RTS) game you must build up your forces mission by mission to destroy the king and end his reign of terror. The Dark Legions is full of battles and surprises to keep you sucked in. There are two ways to play The Dark Legions, Campaign and “Instant Action”. In Campaign mode, you follow the story of Theodoric and King Frank Kalap. You will be challenged by various missions including recruiting soldiers, eliminating enemy forces and establishing formidable bases to defend your area. The maps are varied and include areas along the coast to allow for ship building. In Instant Action there are no missions other than to eliminate the enemy. You start with just the basics and must build your base large enough to take out the enemy before the enemy takes you out. The Dark Legions is played like normal RTS games. 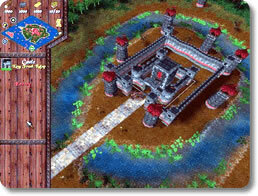 You construct various buildings that in turn can be used to train troops, provide defense or necessary upgrades. A building tree is used so you must build certain buildings to allow the construction of more advanced buildings. An example would be needing to build a blacksmith before you can build a barracks. Another important aspect of this game is resource gathering. Using slaves, who also construct buildings, you will need to harvest gold, stone and wood. The materials are then used to construct all the various things you will need. 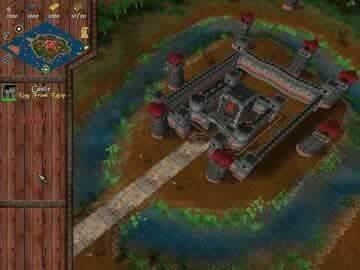 The graphics are not extraordinary for a RTS but they suit the medieval theme nicely. The art is very similar to Warcraft or Civilization III. The “fog of war”, or blackness that covers the areas of the map you have not explored, adds mystery to the game since you will never know whats coming unless you keep troops posted everywhere. The game also employs all the standard sounds such as chopping wood and mining noises. While this is a well made game, there are a few drawbacks. First, there are no difficulty settings so it might be too easy at the beginning for advanced players or too fast paced for new players. The difficulty increases as you progress through the game. For new players there is a tutorial mode which will help get you accustomed to the controls and how to play, allowing you to overcome the initial challenges. Also most starting areas are crowded with trees which must be cleared before a substantial town can be built. This is time consuming and you can't focus on beating the missions while you are using all your slaves to clear the forest for expansion. In The Dark Legions you must build and command your armies in the fight against the evil King Frank Kalap. The few minor drawbacks can easily be overcome by players of any skill level. The point-click controls are easy and once you have the hang of that, you will start planning out attacks and expansions in no time. This game offers fun for anyone who is a fan of RTS games and would be excellent for anyone who had an interest in playing one.